Finally, a skills-based, innovative, tobacco-cessation and preventive maintenance workbook and tape program packed with powerful techniques, activities, and effective options for change! Learn to use affirmations, aversion, behavior mod, creativity, humor, hypnosis, relaxation, scripts, resources and more. Whether you use meds, nicotine-replacement, a formal program, a group, computer, or go it alone, LIFE CHANGES complements YOUR PLAN with the SKILLS for QUITTING ALL TOBACCO for LIFE! LIFE CHANGES by David L. Johnson, Ph.D. & Carole A. Johnson is a book anyone addicted to tobacco will wish they had found it years ago. As a motivational speaker that stresses results, I was happy to see that Life Changes had a similar orientation. The authors use a number of powerful techniques to help a person beat tobacco addiction. Techniques and strategies that have proven to help people make personal changes with affirmations, reasonable goals, daily plans to achieve them, visualization, relaxation, and appropriately stated aversive and positive suggestions. All of the more than 120 techniques and strategies put together form a supportive, personal framework that empowers one to focus on short-term, then life-long results. The key principles and skills provide more ways to use setbacks, when necessary, to learn more about ourselves and enable us to use them to bounce back quickly with less fear of relapse. 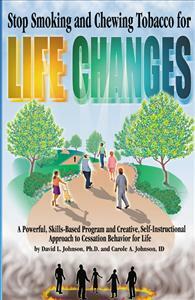 Life Changes uses a self-instructional, self-paced approach that anyone can use, with an emphasis on taking personal responsibility to learn the skills you need. You can start at any point in the book, and implement the steps in the order you feel most confident with. I love how the book relies on the reader to be imaginative and use their creativity to apply the program to daily life and adapt the skills to their goal of beating tobacco for life. Life Changes is a self-instructional, self-paced program that works in proportion to the time and attention you give to learning how to use the program skills daily. You may have tried to beat tobacco many times, but this time buy a book to use that builds on what you know for life changes. I highly recommend it!